Whether you are in need of college dorm safes or you are looking for a new safe for your office, Value Safes is here to help. Even some of the most durable safes can’t withstand high temperatures, which is why we offer a selection of high-quality fire proof safes. Any time you order a fireproof safe from us, you receive a product that will protect your belongings in temperatures up to 1,700F. The selection of safes found on this page will remain durable in a fire for up to one hour. This allows for plenty of time to put out the fire and retrieve the safe before any damage is done to your belongings inside. These safes also come with a variety of additional features including programmable digital locks, display dates, and more. No matter what type of items you need to protect, rely on these one hour fire proof safes to get the job done. Browse our site to learn more about our products and place your order today. For more information, contact Value Safes today. The Sentry OS0401 Safe will safeguard your valuables in the event of either a house fire or theft, as it was made to offer 1 hour of fire protection in up to 1700 degrees Fahrenheit. Protected behind a 3 number combination and tubular key lock, the safe has a .8 cubic capacity perfect for small items and documents. 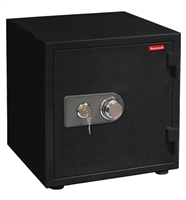 This safe weighs 82 lbs, and can also be bolted to the floor to deter theft. For more information, contact us today! Get the ultimate protection for your valuables from theft and damaging fire with the Honeywell 2112 Fire Safe, featuring a storage capacity of .55 cubic feet. This safe is able to withstand external temperatures of up to 1700° F for up to one hour, giving you unprecedented levels of peace of mind. Get added protection from leaks, spills, and other forms of water damage with the water resistant door. Get the ultimate protection for your valuables from theft and damaging fire with the Honeywell 2113 Fire Safe. 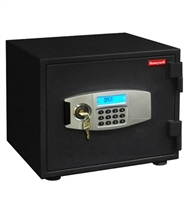 This safe can withstand external temperatures of up to 1700° F for up to one hour, giving you peace of mind and a storage capacity of .6 cubic feet. The water resistant door gives your valuables added protection from leaks, spills, and other forms of water damage. The Sentry OS0810 Fire Proof Safe can provide your important documents and valuables with 1 hour of fire protection in up to 1700 degrees Fahrenheit. 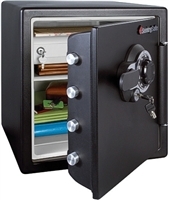 This safe features 1.9 cubic feet of interior capacity, along with locking drawers, shelves, and treys on the inside to easily organize your items Open and close the safe using the 3 number combination and tubular key lock, designed to deter any type of theft. For more information, contact us. Keep your valuables organized and safe from fire and theft with the Sentry SFW123DEB. This safe has the ability to offer protection for 1 hour in heat up to 1700 degrees Fahrenheit. Everything is protected behind the included 3 number combination and tubular key lock, made to resist any form of breach. The safe’s interior features many adjustable shelves, drawers, and racks, and boasts 1.19 cubic feet of space. Contact us today for more information! Safeguard your valuables from fire with the maximum available protection in home safes. This safe from Hollon features thick walls and doors for unrestricted protection from fire and even the water from sprinklers or the fireman’s hose. Your valuables are protected from an external temperature of up to 1750° F, while maintaining an internal temperature of only 350° F.
Shield your valuables from both fire and water with the maximum available protection in home safes. This Hollon Home Safe offers ­­­­­­­­up to two hours’ worth of protection at an external temperature of up to a blazing 1750° F, while maintaining an internal temperature of 350° F. It also features a grooved door seal that will defend the safe against water from the fireman’s hose or sprinklers. Safeguard your valuables from damaging water and fire with 100% more protection than the average home safe with this Hollon HS-500E fireproof safe. Even while being tested at temperatures up to a blazing 1750° F, this safe is able to maintain an internal temperature of a low 350° F. On top of all that, it’s even 30-foot impact rated! 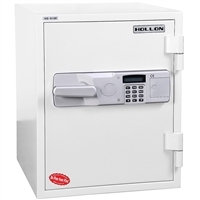 Get maximum protection from damaging water and fire with this Hollon HS-360E Home Safe, perfect for shielding any of your valuables. 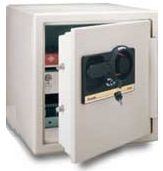 This safe offers you a full 100% more protection than the average home safe with thick walls and a grooved door seal. Protect your family’s valuables from external temperatures of up to 1750° F, all while maintaining an internal temperature of only 350° F.
Keep valuables protected from damaging fire and theft with the Honeywell 2105 Fire Safe. Featuring 1.2 cubic feet of storage capacity, this safe can also withstand external temperatures of up to 1700° F for up to one hour, you get peace of mind that your valuables are shielded. The water resistant door also provides added protection against damaging leaks or spills. Secure your valuables and protect them against damaging fire and theft with the Honeywell 2115 Fire Safe. Featuring 1.2 cubic feet of storage capacity, this safe can also withstand external temperatures of up to 1700° F for up to one hour, you get peace of mind that your valuables are shielded. The water resistant door combats damage from leaks, spills, and other forms of water. Get the maximum protection from damaging fire and water with this Hollon HS-610E Home Safe, offering you a full 100% more protection than the average home safe. The HS-610E is fireproof for up to two hours for up to a blazing 1750° F while maintaining an internal temperature of only 350° F. To top it all off, this safe is 30-foot impact rated! 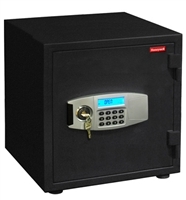 The Sentry S8771 Fireproof Safe is perfect for either home or commercial use, as it offers a large enough capacity to easily accommodate either. Offering 1-hour fire protection, the safe features both an electronic lock and key lock for added protection from theft. The large interior comes complete with 2 adjustable shelves and a locking drawer for small valuables, and the safe itself comes on wheels for easy mobility. 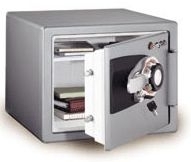 For more information on this or other safes, contact us today.